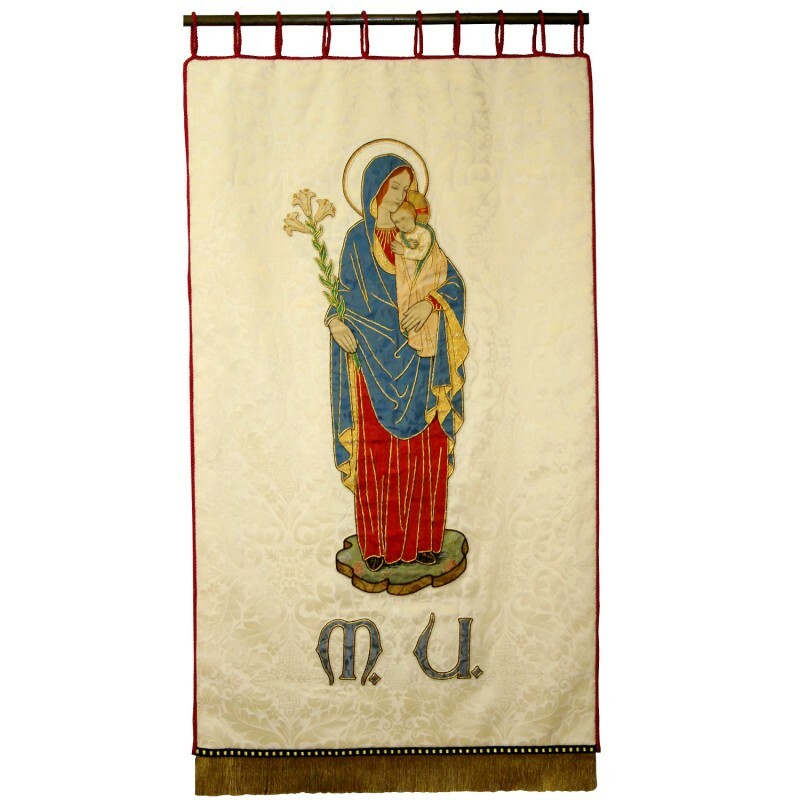 It is an unfortunate reality that if you were to make any mention of a church "banner" in many liturgical circles, it would likely result in a negative or at least pensive reaction. This reaction is entirely understandable for the reason that since the 1960's onward a church banner has, almost inevitably, been a product that was rather 'elementary' and craft-like in both style and execution, not involving noble materials, embroideries or other aspects of the artistic tradition of the Church, instead being constructions of felt and glue. Most often these were banners that were hung in churches as decorations but, whatever the case, they certainly haven't been worthy of the Church's artistic legacy compared to what has been and what could be. A classic example of a turn of the century gothic revival processional banner, designed by G.F Bodley and executed by Watts & Co. A model of what a processional banner ought to be. 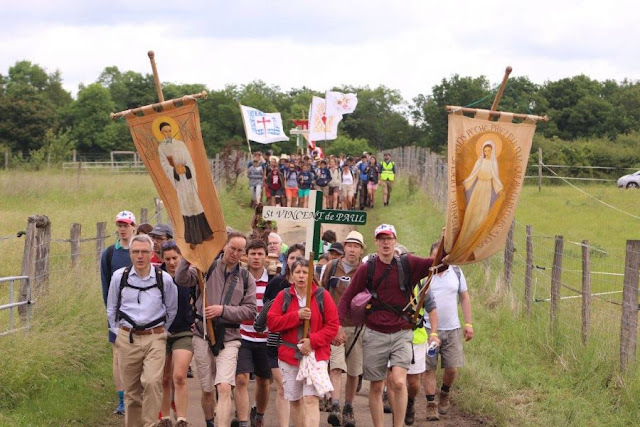 It would seem as though the tradition of noble processional banners is now a lost art; a thing of the past, having died out in the early 20th century would you not say? Think again. 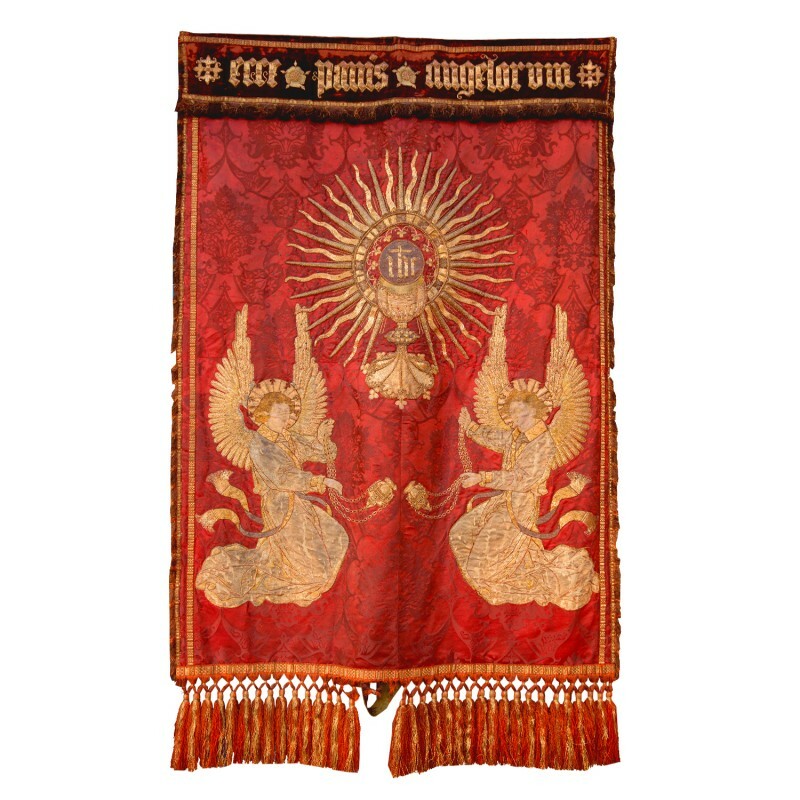 Watts & Co. of London are capable of producing processional banners that are very much in the gothic revival tradition and I thought I would show a selection of their contemporary work in this regard. (The captions beneath each banner come from the site of Watts & Co.). 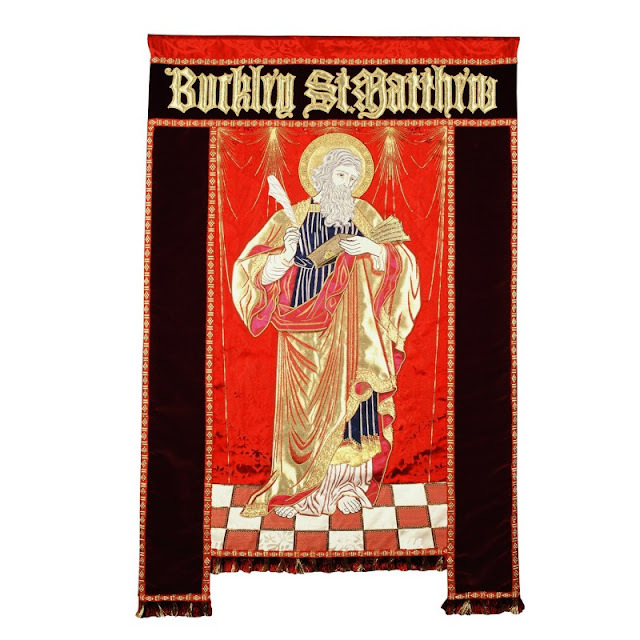 "Depicting a hand embroidered and appliqued figure of St. Matthew the Apostle and Evangelist, on Sarum red Gothic, with velvet border, and exclusive Watts & Co trimmings." 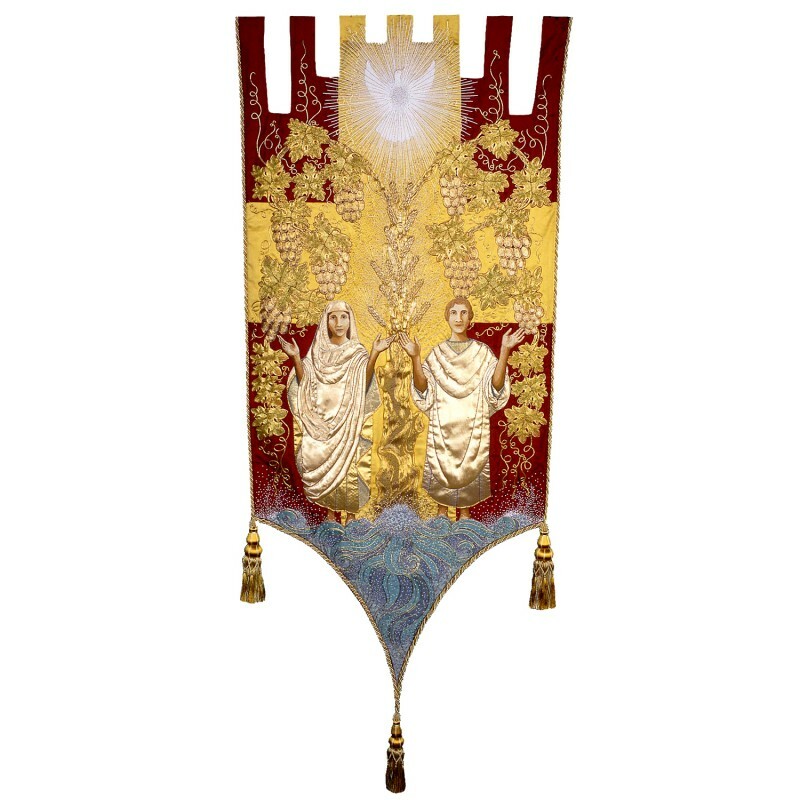 "One of our most extraordinary commissions to date, made for York Minster, and depicting creation and the garden of Eden, the Crucifixion, and the new Sacramental life of the church. Worked entirely in hand embroidery, these banners represent one of the finest examples of work by our former creative director, D.J. Gazeley." "On cream Florence, with a beautiful figure of the Virgin and Child, hand embroidered and appliqued. Trimed with dice braid and red cord." 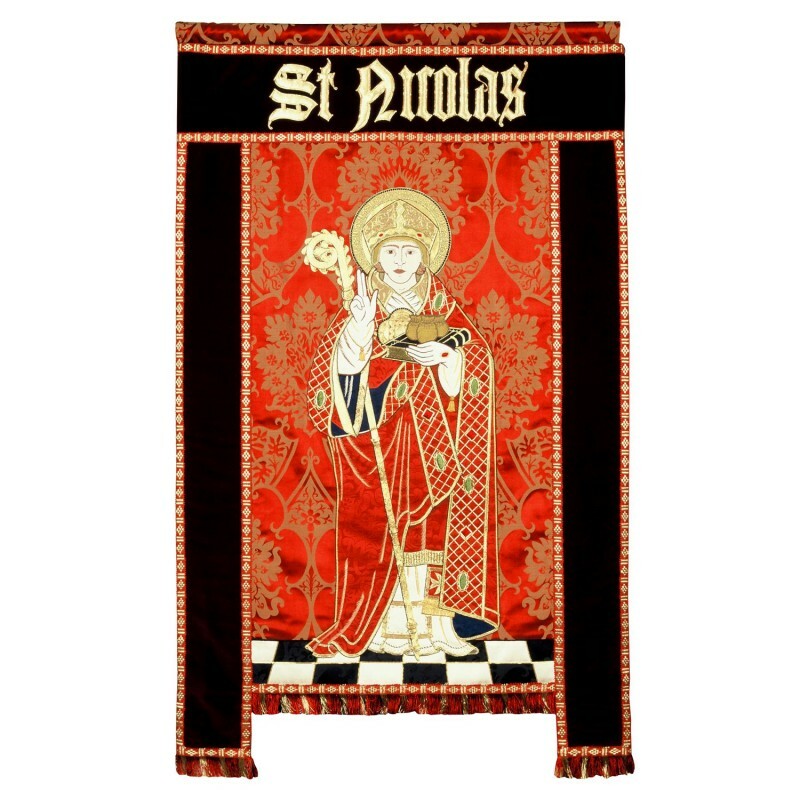 "A banner depicting St. Nicolas of Tyra, hand appliqued and mounted on Sarum Red and Gold Gothic, with velvet borders and Watts exclusive trimmings." 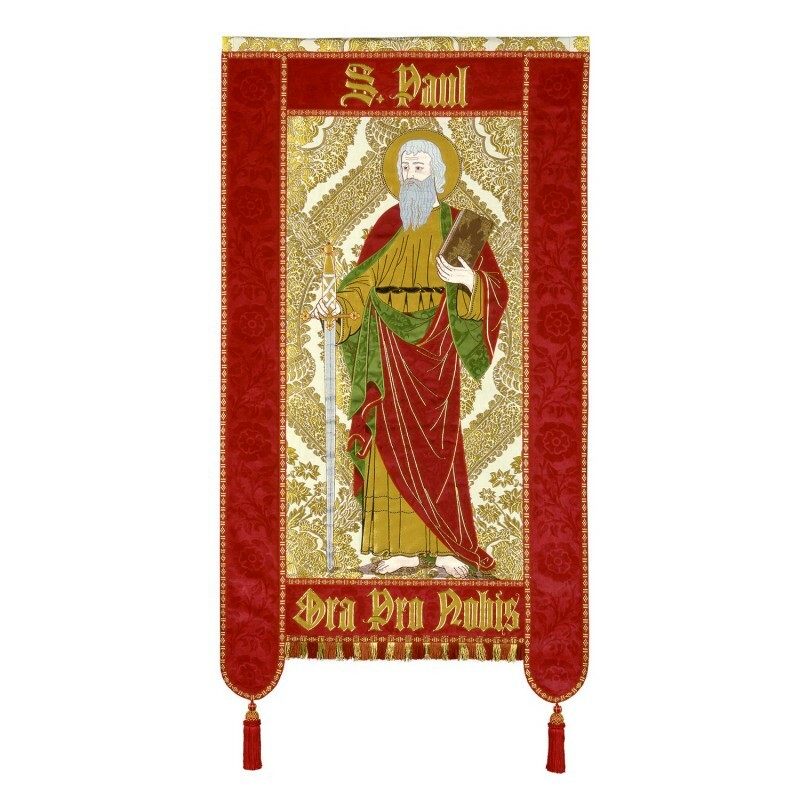 "Hand embroidered and appliqued figure of St. Paul the Apostle, mounted on cream and gold Memlinc, with Shongour fabric as a border, and Diamond & Lay braid and fringe as trim." Processional banners can add incredible beauty to a parish and its festal liturgies in particular. 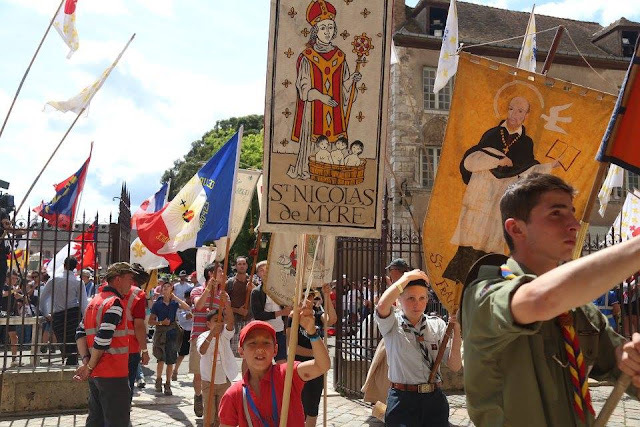 In fact, when one thinks of the famous Chartres pilgrimage and others like it, aside from the Masses themselves, one of the things that truly stands out for many are the processional banners which accompany the pilgrims on their pilgrimage. They are striking and they make an impact. The important point here, of course, is simply this: skills have not necessarily been lost today, they can be found if you seek them -- but you won't likely find them in ready to order catalogues. If we are going to work the reclaim excellence in the liturgical arts, we must make efforts to do so, and that includes commissioning liturgical craftsmen to work with us to produce items of real quality, nobility and originality. These things are not 'free' of course -- but then, the spiritual dividends that qualitative liturgical arts can produce are far greater and longer lasting than any short term monetary investment.